The new Heritage Classic adds a fresh edge to chromed ‘50s nostalgia. The history is still there, but it’s done with a dark style, modern edge and totally reinvigorated ride. At the heart of it all is a blacked-out Milwaukee-Eight® V-Twin engine. 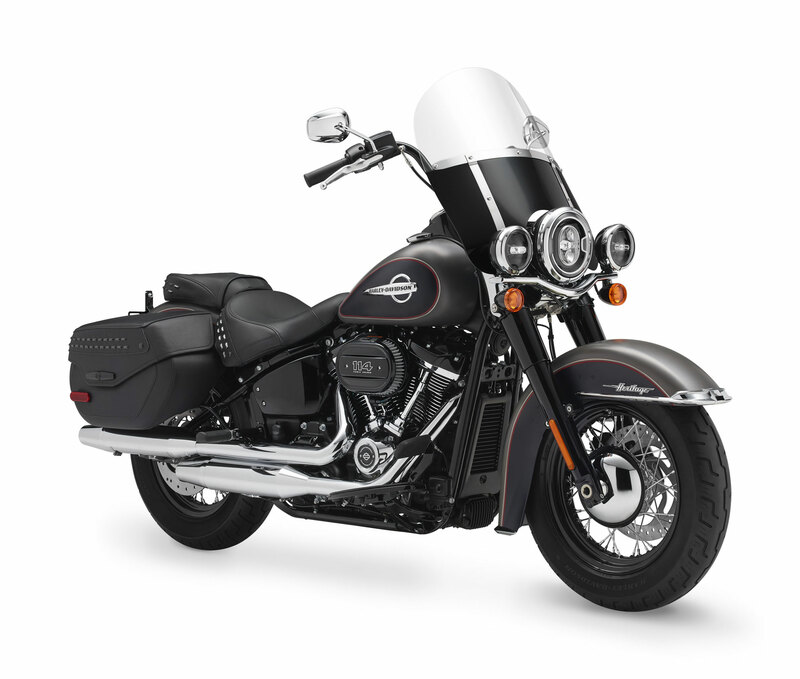 It has reduced weight, awesome acceleration and smooth ride of an all-new Softail® motorcycle, and features a windshield and hard saddlebags for light touring. The Heritage Classic 114 comes with the new Milwaukee-Eight 114 engine. 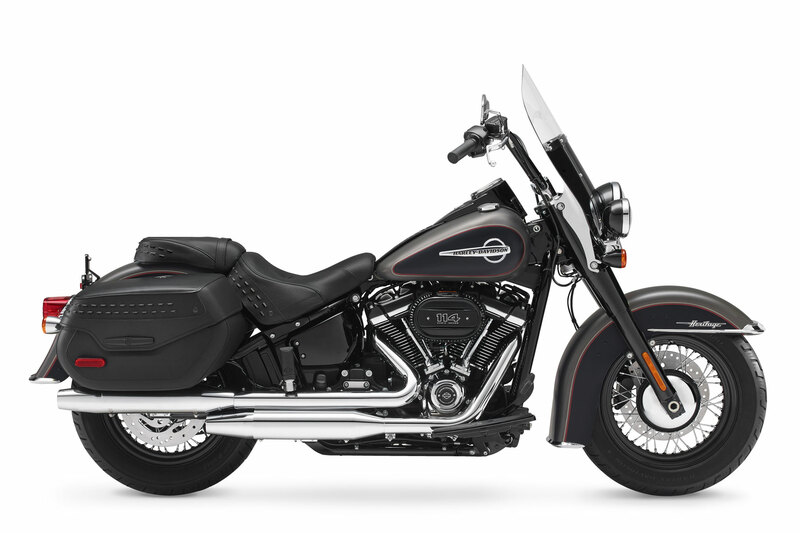 Authentic innovation meets true Harley-Davidson soul in the reinvented Softail® family. The most powerful, agile, and responsive cruisers in Harley-Davidson history feature a lighter and stiffer frame, high-performance suspension and the smooth, unrelenting torque of a fully counter-balanced Milwaukee-Eight® V-Twin engine. Each Softail® model has a distinctive look and attitude that stays true to the roots of Harley-Davidson® custom motorcycle design. 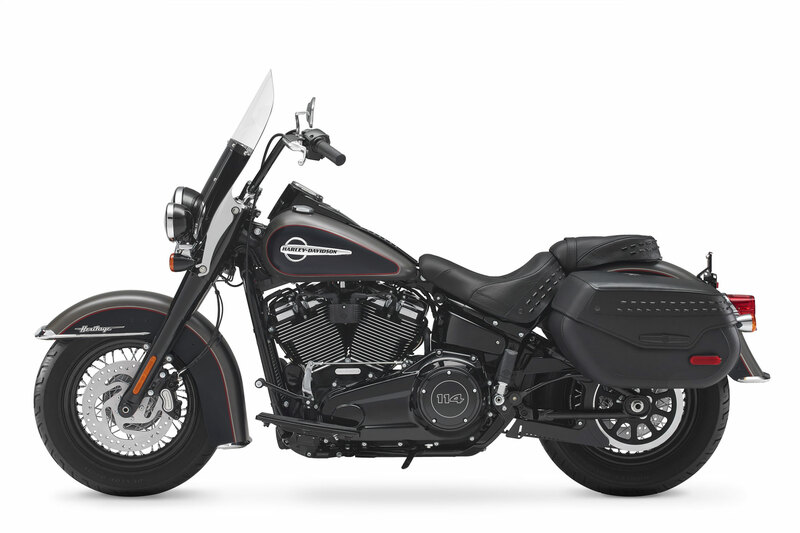 Dark classic style with a modern edge, from the full fenders to the blacked-out Milwaukee-Eight® V-Twin engine. Reduced weight, awesome acceleration, and totally reinvigorated ride. New Showa® SDBV® suspension technology provides the performance of a racing-style cartridge fork for reduced weight with linear damping characteristics. MILWAUKEE (Aug. 22, 2017) – To celebrate Harley-Davidson’s 115th Anniversary year, the Motor Company is launching a custom revolution: Eight all-new Softail® models that merge the hard-riding performance of the Dyna® line with the unparalleled custom look of the Softail line. Designed under the largest product development project in company history, the new bikes compared to prior year models feature a stiffer and significantly lighter frame built to harness the pulse-quickening torque of the new dual-counterbalanced Milwaukee-Eight® 107 and 114 engines. With high-performance dual-bending valve front suspension and an easily adjustable hidden rear mono-shock, the aggressively styled 2018 Softail models are faster, lighter and better handling than any of their Big Twin cruiser predecessors. The handling of a Softail motorcycle enters a new era with a lighter, more rigid frame that elevates form and function to a higher plane, while maintaining the classic look of a hard tail and delivers a thoroughly modern ride. Benefits of the new chassis include increased lean angles, sharper turn-in response, quicker acceleration, nimble flick-ability, lighter weight, and easier side-stand liftoff than predecessor Softail and Dyna models. The steel foundation of the next generation of custom Harley-Davidson motorcycles has been forged. A new high stiffness carbon steel tubular frame forms the core of the 2018 Softail chassis. The completely redesigned frame and swingarm significantly increase the rigidity of the new chassis. The frame itself is 65 percent stiffer than the 2017 Softail frame, which leads to a 34 percent increase in overall chassis stiffness. The frame design achieves reduced complexity with a 50 percent reduction in component parts and a 22 percent reduction in welds. There are two unique swingarms, one for narrow and one for wide rear tires. The wide chassis is 15 percent lighter (13 pounds) and the narrow chassis is 20 percent (18 pounds) lighter than the 2017 Softail frame. The swingarm transfers rear wheel movement to the under-seat mono-shock while maintaining the pure, classic lines of a hard tail frame. All-new front and rear suspension components are calibrated to match the dynamics of the new chassis, wheels and tires to enhance the comfort, control and performance of the 2018 Softail® motorcycles. The new high-performance dual-bending valve front suspension, which was first introduced on 2017 Touring models, delivers damping performance that is similar to a cartridge fork but with improved, more responsive damping characteristics. The suspension is optimized for both comfortable cruising and spirited riding with 130 mm of bump-devouring travel. Retuned and optimized rake and trail also enhance the motorcycles’ handling performance. The new mono-shock rear suspension preserves the classic hard tail look while revamped geometry improves ride quality, traction and control. The new easily adjustable mono-shock enables a 240 pound range of payload capacity for increased passenger comfort and enhanced dynamic handling compared to 2017 Softail models. 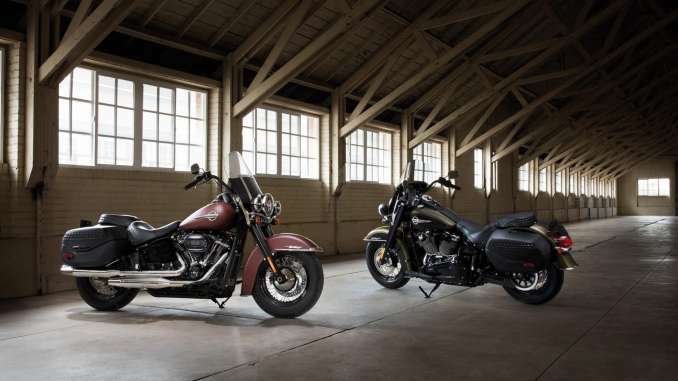 The all-new Softail models are up to 35 pounds* lighter than 2017 models, delivering an improved power-to-weight ratio that provides quicker acceleration, better braking and enhanced dynamic cornering capability combined with increased lean angles. Some models feature new tires specifically designed to work with the new Softail chassis and feature optimized constructions and improved compounds for a confident, long-wearing ride in all riding conditions. New seat designs and materials provide an improved fit for a wider range of riders and greater comfort for cruising. Bar none, the 2018 Softail models are the best handling cruisers Harley-Davidson has ever produced. 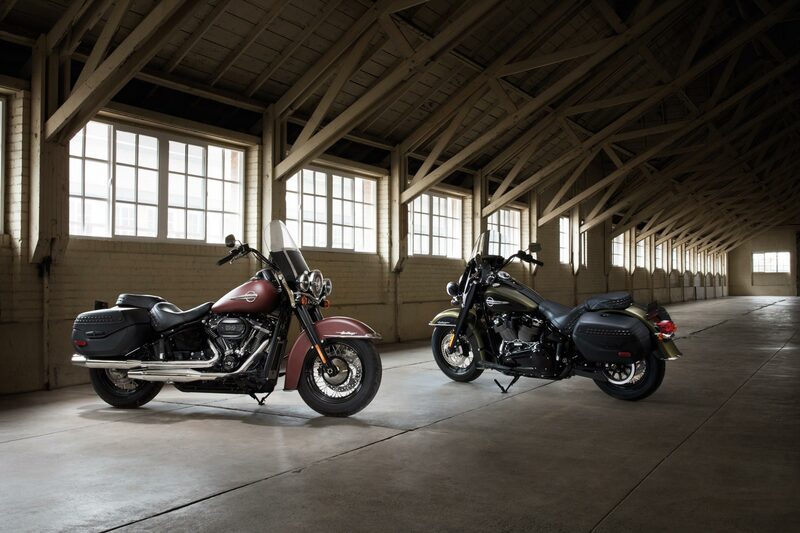 All 2018 Softail models get a new heartbeat from the most powerful engines ever offered in Harley-Davidson® Big Twin cruisers, the new Milwaukee-Eight® 107 and 114 V-Twins. Milwaukee-Eight engines retain the iconic 45-degree V-Twin cylinder angle with a broad-shouldered top end accentuated by a single camshaft design that tapers to a slim bottom end for a muscular contour. The new Softail frame’s rigid engine mounting is engineered to tightly package the engine and reinforce the chassis stiffness. Milwaukee-Eight engines for Softail models feature a refined dual internally counter-balanced system that reduces engine vibration while maintaining the familiar Harley-Davidson feel. Harley-Davidson’s trademark “potato-potato-potato” sound comes through strong with less intake and mechanical noise. Interpreting Harley-Davidson’s history, authenticity and styling DNA through a modern lens, the eight new Softail models feature all-new designs that strongly differentiate them from their predecessors and each other. From a new base of style, comfort and performance, the next generation of factory custom cruisers are ready for riders to take even higher with their own personalization. The legendary Fat Boy motorcycle that defined contemporary custom style for decades has outdone itself. Ripped and refined satin-chrome finishes deliver a bold, muscular styling statement showing off its powerful engine and new and improved ride and handling. Design cues evoke the blacked-out styling of vintage ‘50s Harley-Davidson models updated with a modern edge. Inspired by the individualism of the ‘70s custom chopper era that birthed the original, the new Low Rider model is lighter and faster with corner-carving handling unimaginable back in the day. Stripped to its essential elements, the Softail Slim model pays homage to post-war custom bobbers with a narrow rear end, trimmed front fender, solo seat and minimal chrome. A classic hi-line showstopper that stands out on any boulevard, the Deluxe glistens with bright chrome while delivering the ride of a seriously modern machine. With more lean angle and agility than ever imagined in a bike carrying so much dragster attitude and style, the all-new Breakout model takes long, lean muscle to a modern edge. Asphalt-eating traction, pothole-devouring suspension, agile cornering, and a blacked-out take-no-prisoners look make the Fat Bob® model a groundbreaking motorcycle that could only come from Harley-Davidson. A bare-bones bike with go-anywhere DNA, the all-new Street Bob motorcycle has a fists-in-the-wind attitude with nothing extra to weigh it down. Seat Height, Laden 7 26.3 in. Weight, As Shipped 697 lb. Weight, In Running Order 728 lb. 7.. Measurement reflects 180 lb. (81.7 kg) operator weight. 6. Measurement reflects 180 lb. (81.7 kg) operator weight. 7. North America security system includes immobilizer; outside North America the security system includes immobilizer and siren. 8. Standard and optional wheels may vary by country and region. 1. Availability of colours may vary from dealer to dealer and is subject to change without further notice. 2. Recommended 95 octane or higher fuel (R+M)/2. 3. Values shown are nominal. Performance may vary by country and region. 5. Prices shown are suggested retail prices only. Please contact your nearest dealer for further details. 6. Security system includes immobiliser and siren. 7. Standard and optional wheels may vary by country and region. June 11, 2018 Michael Le Pard Events, News Comments Off on BMW Motorrad International GS Trophy Central Asia 2018. Day 8. Final. Team South Africa victorious – again!